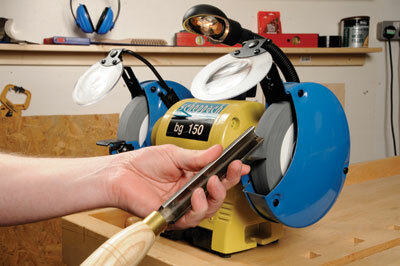 We all know that sharp tools are essential for effective woodworking and that holds true for turners. The bench grinder forms the backbone of most turner's sharpening equipment and it is probably true to say that a 150mm (6in) grinder is the most commonly used. 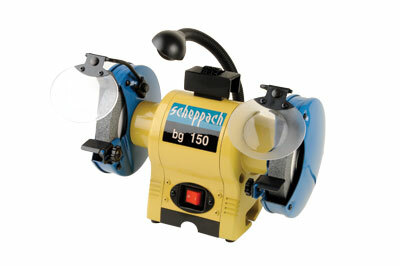 This grinder from Sheppach is one that I thought would be worth a look at. This grinder has the usual body and wheel guards one expects to see but also comes with a detachable star-wheel dresser as standard and one of the spark shields doubles up as a magnifying lens as well as having a flexible light. Clearly a lot of thought has gone into the features of this machine. The set-up of the various bits and bobs (tools rests, spark shields and holding arms) takes about 10 minutes and then you are ready to go. It sports two wheels: one coarse and one fine, which both cut well. I would usually automatically suggest replacing the fine wheel with an aluminium oxide one. These wheels seemed to cut better than the usual 'engineer' wheels found on many grinders, so I would advise making up your own mind before automatically replacing one simply because it is received wisdom that we should. The machine is well built, the housings and wheel casings are sturdy and the magnifying lens works well. The toolrests however are small - smaller than most others on the market - and unlike some are adjustable. 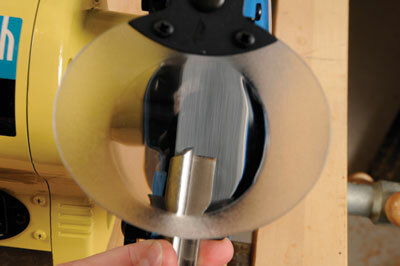 However, if you decide to move them forward a lot with some tilt applied, then the bracket can get in the way of the tool swing needed for sharpening some tools. Since most people are using a grinding jig of some sort now, simply move them to a position that is not in the way and fit the jig of your choice. The machine is a very good one. It is sturdy in use and it does not vibrate around the table. A bit more thought has gone into this one that some others available. "It is sturdy in use and it does not vibrate around the table"